Inflammation is a key part of the body’s immune response and without it, our bodies can't heal. 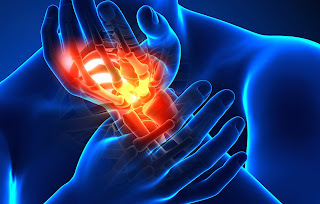 However, when it is out of control—as in the case of rheumatoid arthritis for example—it can be damaging to the body. In addition, inflammation is believed to play a role in obesity, diabetes, depression and even heart disease. It is important to know that foods that are high in sugar and saturated fat, as well as refined carbohydrates (white bread and pastries) can spur inflammation. Such foods can cause overactivity in the immune system, which may lead to bothersome conditions such as joint pain, fatigue, and even damage to the blood vessels. In addition, researchers have shown that fish oil helps reduce joint swelling and pain, and even the duration of morning stiffness. Best sources include: Salmon, sardines, herring, tuna anchovies, scallops and other cold-water fish. To reduce levels of inflammation, you should do your best to commit to an overall healthy diet. Not only will it help reduce inflammation but improve your mood and overall quality of life.